Tower 1 at the City Creek Center is topping out in Salt Lake City. This photo is taken from Temple Square in downtown. This condo tower will have amazing views of the Salt Lake Temple. 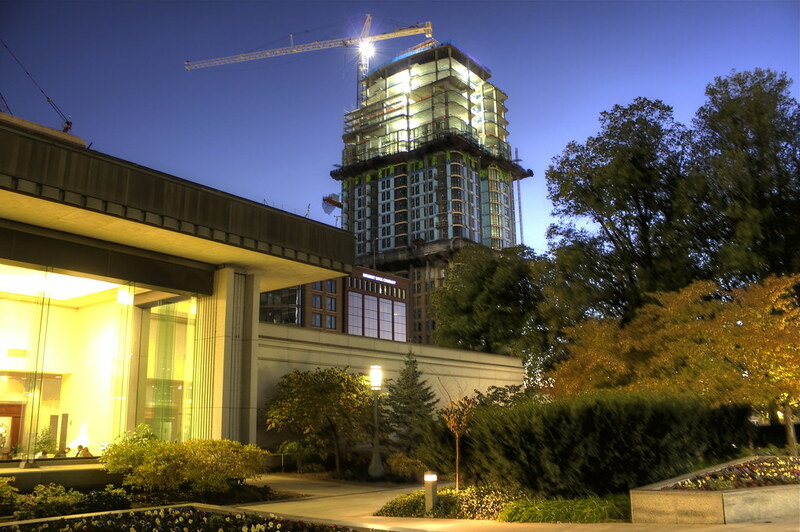 It has been awesome to read in the news lately about how well all of the condos are selling. The current plan is to have Tower 2 be capped at 3 levels which will house the retail and then when the demand is there, build the remaining 17 stories. Not that my opinion matters to them much, but I think it much wiser to build the tower now. You don't have to finish the interior but at the very least build the shell and have it ready to go. Building materials right now are soooo much cheaper than they were and I only think they will go up from here as the recession fades. Here is Tower 1 towering over Temple Square.